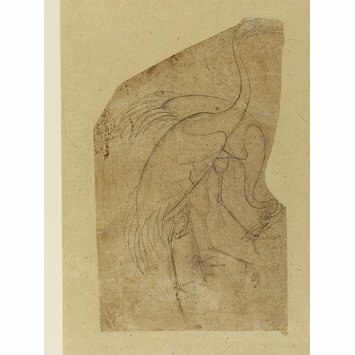 The drawing of cranes in ink on paper may have been done by Mansur, one of the leading artists of the Mughal court in the early 17th century, during the reign of Jahangir (r. 1605-1627). The emperor's memoirs show him to have been keenly interested in all aspects of the natural world. He kept a pair of saras cranes for at least five years, studying them carefully and interspersing his account of the events of courtly life with details about the birds' nesting habits. 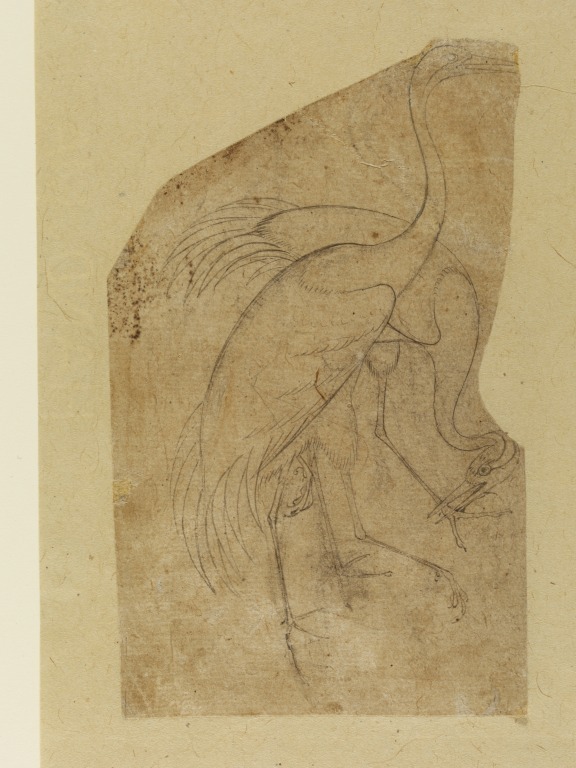 An 18th century copy of a lost 17th century painting of cranes by Mansur is in the V&A (IM.122A-1921), and its composition is close to this drawing. In other cases, where copies and the original work have survived, the signatures or attributions on the originals have been included in the copy. Mansur was given the title "Nadir al-asr", or Wonder of the Age, by Jahangir, and was renowned for his studies of birds, animals and flowers. Minor corrections may be seen in the drawing. For one of the birds, an alternative leg has been drawn and partly erased. Brush drawing, ink on paper, depicting two Indian cranes.